Looking for something fun and educational to do with the kids on a hot Arizona day? 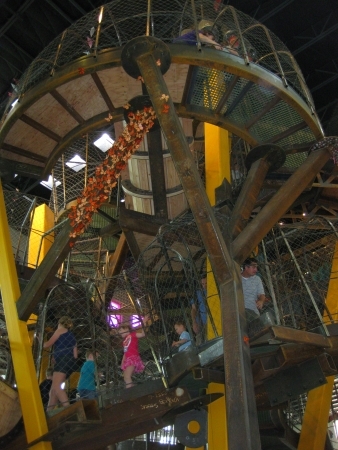 No matter the weather outside, children of all ages are sure to have blast inside the Children’s Museum of Phoenix. Don’t just sit back and watch…get in on the action with your kids! Play shopkeeper or shopper with your children at the Market, a make believe store of sorts. Then help to build a fort with foam bricks, crates, buckets and fabric at Building Big. You just may remember how much fun it is to play like a kid! How did I get my children to act so sweetly in the Noodle Forest? I don’t remember, but I love it! For most things in life, you (the parents) are in charge. You tell your children when to get in the car for school, which foods they should eat, how to tie their shoes, when to do their homework, and where to put their dirty laundry. At the Children’s Museum of Phoenix, let them be in charge for a change. Give your kids the freedom to choose which exhibits to explore and for how long. Some children will want to snuggle up with you and a book for story time in the Book Loft. 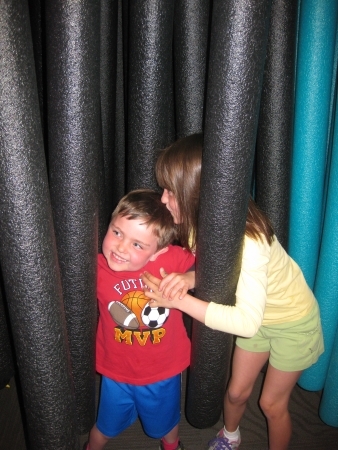 Others will delight in getting lost amongst Styrofoam tubes in the Noodle Forest. Watching your offspring discover the museum in their own way, at their own pace just may give you a bit of insight to the workings of their unique minds and personalities. Want to avoid the crowds? Go midweek to avoid weekend crowds, if possible. You may want to call first to see if any large groups from schools or camps will be at the museum when you plan to visit so you can schedule accordingly. Don’t dress up your darlings in their Easter Sunday (or Passover) finest. In the Art Studio kids can express their inner artist with colorful paints and create with gobs of glue. This can make for some beautiful creations…and messy clothes. Smocks are available, but to be on the safe side, I’d put everyone in comfortable dark play clothes that you don’t mind getting dirty. This museum is not the kind of place where you can sit back and surf the Web on your smart phone while young ones play quietly. It’s an interactive space with oh-so-much to discover and you could easily lose sight of kiddos if you don’t watch vigilantly. Big kids can get rambunctious amidst all the excitement so be extra cautious when visiting with younger tots. 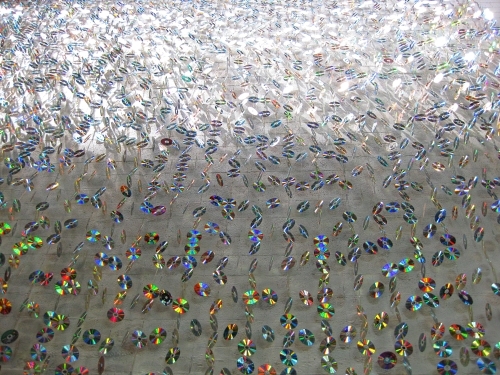 This is especially true at Whoosh!, which is described by the museum’s website as, “a jumble of connected tubes where children feed scarves in a rainbow of colors into the transparent, air-powered structure. The colorful scarves shoot up through the pipes at high speeds, to heights of 20 feet or more, and are released in a burst of energy from high above.” You might want to stand guard over little ones to make sure they don’t get hurt by errant elbows and giggling grade-schoolers. After a day at the Children’s Museum of Phoenix, an afternoon nap and a mellow evening may be in order. Your kids will be tuckered out from all of that building, experimenting, playing and thinking. Parents will be tired from trying to keep up! 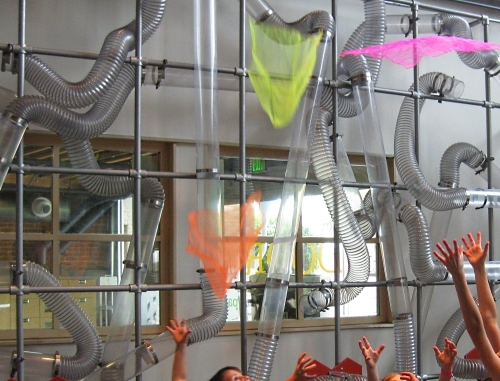 What is your favorite children’s museum and why? Let us know in the comments below! 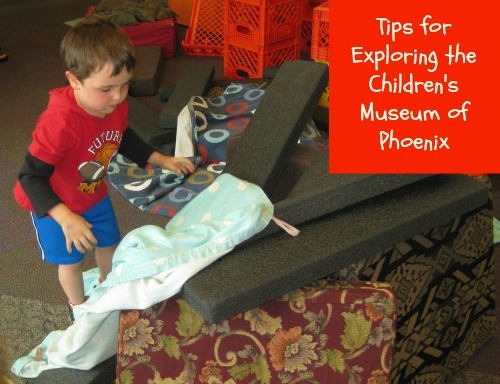 A Note from The Travel Mama: My children and I received admission tickets to the Children’s Museum of Phoenix free of charge. My opinions and observations are mine, as always. With temperatures going up in the Phoenix area this is the sort of place everyone really appreciates. Is this museum something a 9 month old would enjoy? We’ll be in the area next month to visit my parents and would love to find some fun activities for my son. Thanks.